This will be the last challenge over at Scrap-it-lah. Sadly Chow-Chow (who started the blog with Jessy) would have to give this up for her other commitment in life. So, I guess this will also be my last layout for SIL. This month, the challenge is: to include Multi-photo layout using Christmas photos (at least 3) or, if you don’t celebrate Christmas, photos from a similar celebration (no birthdays please!). Glitter or glimmer mist somewhere on your layout. Traditional Christmas colours of red/green/gold (compulsory), plus only ONE other colour OF YOUR CHOICE. (Both plain and printed papers are fine as long as you stick to the colours). I’ve used glimmer mist on my doily and flower then also using glimmer pen to draw on the larger flower. Initial color of the flower is white. My title is from glitter thicker. I’ve also stamp on my doily after misting them. Here is another look on those cluster of flowers from Prima. This year, we had our Christmas tree up early even before November ended.. This is all due to my son – Calvin who was so eager to put up the Christmas tree. So I’ve helped him to set up the tree and he hangs all t hose decoration all by himself! What a great kid. He is waiting for the time to open his presents and really a good test on his patient. Have fun on this December and try out the challenge and create something memorable for yourself. Do check out what the rest of the DTs have done on this challenge. Hello November! Today is 1/11/11 yupe with all the 1. Even more so on 11st November later. 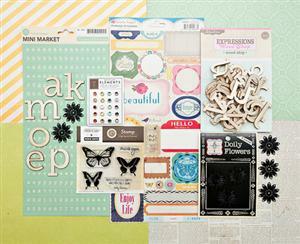 Here is a challenge to start your month – Scrap-it-lah November Challenge. So, start creating and get your layout link in the Mister Linky over at SIL. 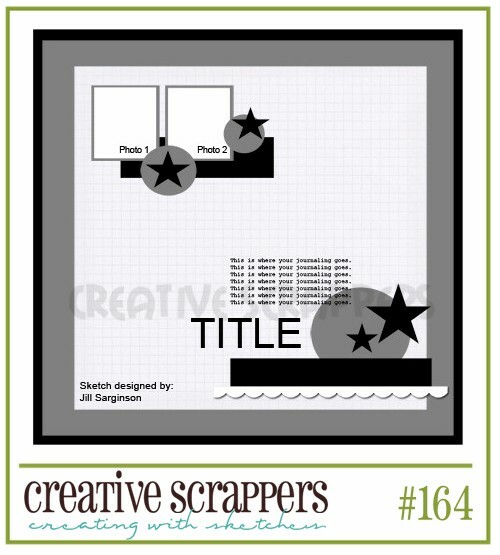 Scrap-it-lah October Challenge is up! This time, the challenge is by Ella Sandberg. Old book paper, sheet music or something similar downloaded off the internet & printed out. I’m using September kit from My Creative Scrapbook. Have cut out the flower from one of the pattern paper and sew on the side of the photo. I’m so glad that this kit has given me all the things that I needed for this challenge. I’ve been lacking behind on scrapbook layout. I’m been busy making bags! Will share more about this in other post. As usual SIL will be offering a Studio Calico Kit as a RAK. However, photo is not available at the moment. 1. Please create a NEW layout for each challenge but you are welcome to combine with other challenges, as long as your layout was specifically designed with Scrap-it-Lah in mind and created AFTER the challenge details were posted! 2. Please remember to mention Scrap-it-Lah somewhere in your blog post; create a link back to the correct challenge post at Scrap-it-Lah. 3. Please include the challenge requirements within your blog post – you are welcome to copy; paste these off the Scrap-it-Lah blog. 4. Please also mention the deadline the challenge ends and let everyone know what prize is up for grabs! All you would have to do is to send in your submissions (we only accept layouts) via the link above by midnight 12pm, 31st October 2011 (Malaysian time). If you have any problems with the link submission, please notify us at chowchow138@gmail.com. Kindly note that we are unable to entertain any project that is sent after the stipulated time and please note that the project sent should solely be submitted for the Scrap-It-Lah challenge and not for any other challenges. Yes, we welcome international submissions as we would love to see Scrap-It-Lah grow. Yes!! It is up! The September challenge over at Scrap-it-lah is up!! Create your own mixed media background, using printed paper as a base. Be sure to include at least 3 different paint colours in whatever effects you fancy. This can be using stamps, bubble wrap, etc etc – its all up to your imagination. Please create a NEW layout for each challenge but you are welcome to combine with other challenges, as long as your layout was specifically designed with Scrap-it-Lah in mind & created AFTER the challenge details were posted! Please remember to mention Scrap-it-Lah somewhere in your blog post & create a link back to the correct challenge post at Scrap-it-Lah. Please include the challenge requirements within your blog post – you are welcome to copy & paste these off the Scrap-it-Lah blog. Please also mention the deadline the challenge ends and let everyone know what prize is up for grabs! Another thing that I just wanted to share here and super excited about is..
I’m getting the stamp in this video!! Ali Edwards | August Studio AE for Technique Tuesday from Ali Edwards on Vimeo. I know.. it is still a bit too early for Christmas paper, but hey, everyday could be Christmas, right? Have fun on the Scrap-it-lah challenge and don’t forget to follow my blog to stand a chance to win MyMemories Suite for free!